Tag Archives for " LinkedIn Groups "
As I’ve written here in the past, I think there are solid business reasons for participating in most social networks these days, but if your business sells primarily to other businesses, you must get more active on LinkedIn. While those numbers were taken from their user base, my experience suggests that the professional decision maker audience that prefers LinkedIn is much more prepared to participate in the kind of traditional authentic networking that leads to lasting business relationships than any other network. The power tool on LinkedIn is Groups. For me this is the closest thing to the proven offline networking groups that exists online today. Groups can give you access to people and discussions related to an industry, topic or even geographic region. 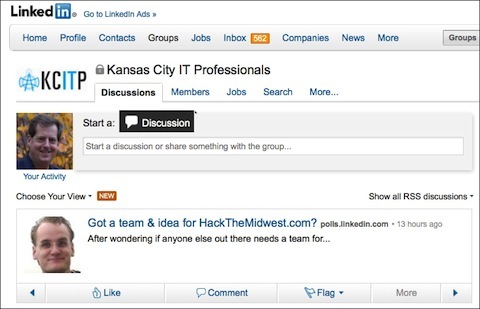 Working LinkedIn Groups effectively is a solid way to build a network and generate leads. Back up to that last sentence and dwell on the word effectively. Effective networking is about providing value, sharing, helping and informing – it’s not about spamming, promoting and selling. Participate in the latter before you’ve earned any credibility and your efforts won’t gain any steam. Currently LinkedIn allows basic members to join up to 50 Groups. Find industry, topic and location specific groups that contain concentrations of people that you would like to network with and join them. Spend time looking at the level of participation and conversations. If all you find is updates with members promoting their businesses move on as this group will be of little benefit. LinkedIn has a “groups you may like” function that suggests groups based on your current profile and connections. Ironically, the best groups for lead generation are those that don’t tolerate blatant self-promotion. Once you’ve joined a group, you have a natural common connection with each group member and LinkedIn gives you the ability to connect based on the mutual group membership. It’s a little thing, but it’s a step beyond simply saying you want to connect. Reach out and make some connections and very simple introductions as to why you joined the group. Look for active members and add relevant replies to a number of posts. This starts the process of some one on one conversation and, since your replies are publicly available to all group members, you can use this technique to demonstrate that you have a lot to offer. Once you get the hang of Groups you should consider creating your own topic group. This is not a company group, it’s one that is set up to discuss a topic that your prospects, customers, partners, and even competitors might find worthwhile. A word of warning – if you want your group to grow and give you the ability to benefit by virtue of your status as the group’s manager, you have to commit the time to curate, moderate, stimulate and facilitate group participation. You must add starter content that gets people talking. You must participate in conversations. You must promote. And above all you must not tolerate spam and self-promotion. Tell people this is you intent up front, give them one warning and kick offenders out. If you don’t set this tone from the very beginning you’ll group members won’t want to stick around. To get the most from your group manager role create a landing page on your own website that promotes the idea behind the group and encourages visitors to join. This will deepen your connection to the group and help people better understand what the group is all about. Lastly, use, but don’t abuse, the announcements function. As a group manager you can send direct announcements to all group members via email. This is a great way to continue to keep your group and its activity front and center. Once you start to get more active on LinkedIn make it a habit to reach out to five connections each week with the sole purpose of saying hi, thank you, I see you got a promotion, wonder what you’ve been working on, etc. I’ve done this in the offline world with handwritten notes for years and the impact is dramatic and long lasting. I can’t tell you how often this simple, personal touch has led to business – even though that was not the intent in any way. It’s amazing how relationships bloom when you genuinely care about people.